A new Vatican document encourages the development of an “apostolate for sports” and cautions against the dangers inherent in competition. “Giving the Best of Yourself,” the first-ever official Vatican document on sports, was released earlier this year by the Dicastery for Laity, the Family and Life. It brings together all the messages of popes about sports since the early part of the 20th century. “Athletic activity, in fact, highlights not only man's valuable physical abilities, but also his intellectual and spiritual capacities. It is not just physical strength and muscular efficiency, but it also has a soul and must show its complete face,” St. John Paul II wrote. This intersection of sport and spirituality comes alive in the Diocese of Erie, where students are encouraged to turn to their faith before, during and after competition. Student athletes representing each high school in the 13-county diocese readily shared their favorite pre-game prayers and inspiration with Faith magazine. Father Patrick Kelly, SJ, an expert who contributed to the revision of “Giving the Best of Yourself,” is impressed by what some of these students say before competition. Father Kelly also is the author of many books and articles on sports and spirituality and Catholic perspectives on sports. The Vatican document calls on the Catholic Church to create and promote an “apostolate for sports” that would show how much the church is committed to the wellbeing of athletes. It asks for pastoral plans for players and athletes, as well as for parents and volunteers. Additionally, it asks for “an educational strategy” to help coaches, teachers and managers find the “best, most holistic” means by which to humanize sports. Most notably, it cautions against highly competitive children’s sports, political and economic pressures on athletes to win “at all costs” and the unsportsmanlike, even violent, behavior of fans. 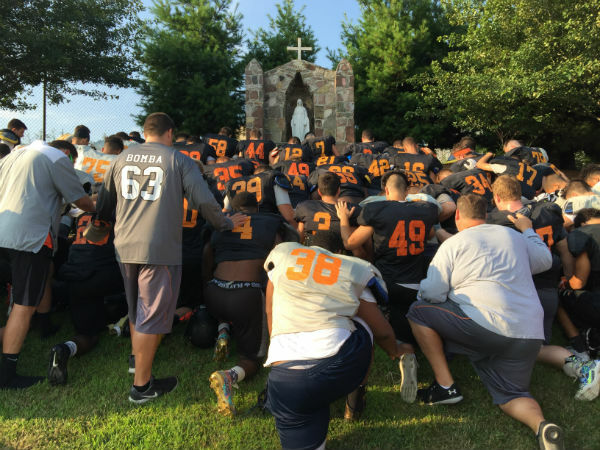 In the Diocese of Erie, faith bolsters work in the classroom and on the playing field, according to Doug Chuzie, director of diocesan athletic programs. “We have a great culture in our schools where athletes are encouraged to do their best on and off the field,” he says. In the past year, teams representing Catholic high schools captured state titles in football, soccer, tennis and basketball. Read a sampling of what motivates diocesan athletes as they enter competition.